A musician performs during a free concert on Ko Kret this weekend. We went to Ko Kret this weekend. It's a small island in the Chao Phraya River in Nonthaburi, north of Bangkok. It was created in 1722 when the Siamese monarch in Ayutthaya (then the capital of the Siamese Kingdom) ordered a canal dug to bypass a horseshoe bend in the Chao Phraya River. The canal separated the Ko Kret peninsula from the mainland and created the island. 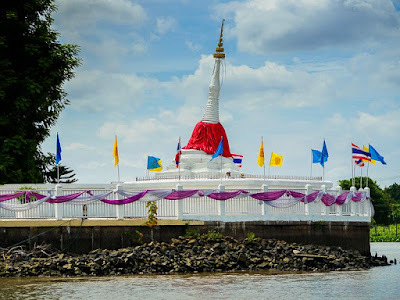 Ko Kret is one of those places we've been meaning to visit but never got around to seeing. It was originally a Mon community and Mon culture is well preserved on Ko Kret. The Mon are an ethnic minority from the Thai / Burma border region. Centuries ago they sided with the Siamese (Thais) during Siam's (Thailand's) near constant wars with the Burmese. The Mons have had a huge role in the culture of both Thailand and Myanmar. Among other things, they brought Theravada Buddhism (the dominant form of Buddhism in both Burma and Thailand) to Indochina. 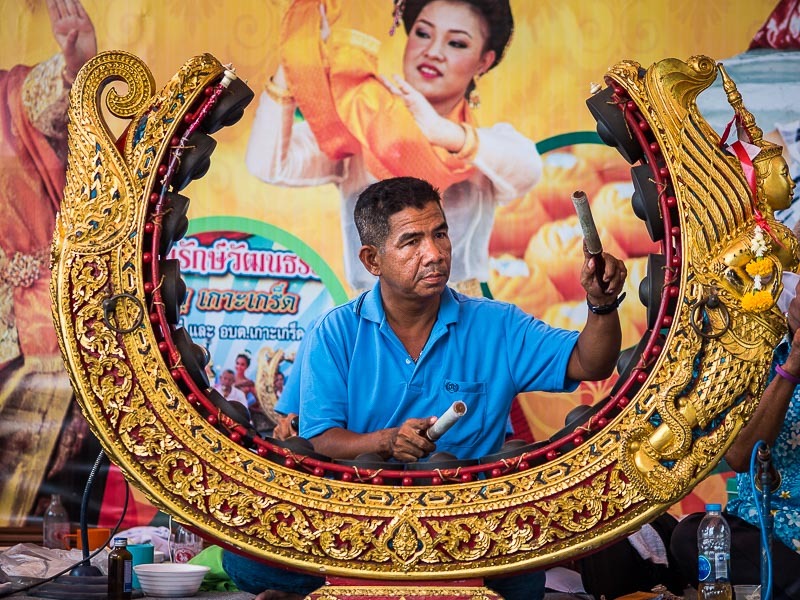 The Mon are a persecuted minority in Burma but are pretty much assimilated into Thai culture. A potter at work in a shop on Ko Kret. 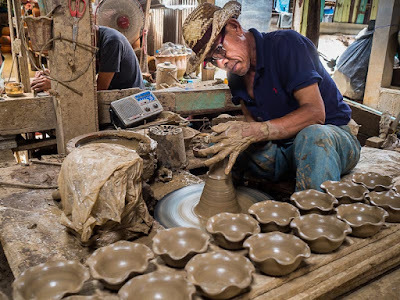 Ko Kret is best known as a place to get Mon style pottery and the place to go for Mon food, especially Mon style fishcakes, close to Bangkok. I like fishcakes, but I completely forgot to try the Mon style ones so I can't say if they live up to the hype. The pottery is lovely and despite the tourists on the island, the potters will explain the process to you if you ask. 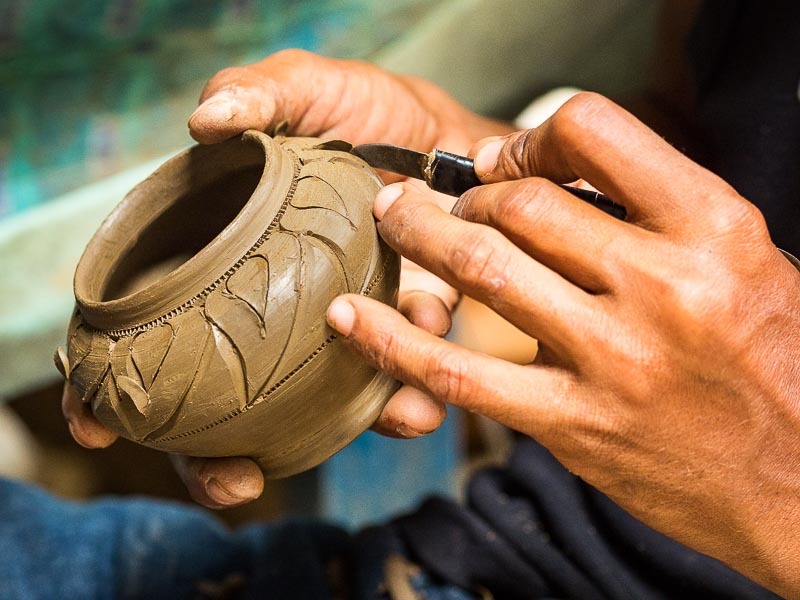 A potter etches a bowl before it goes into a kiln. The bowls bake in the kiln for three days. The island is also well known for its temples. There are seven or eight Buddhist temples on the island, which is only two kilometers long by about one kilometer wide and home to just over 6,000 people. The largest temple, Wat Poramaiyikawat, is the most important Mon temple in Thailand and conducts services in the Mon language. One of the ferries that brings visitors to Ko Kret. A ticket costs 2Baht (roughly .06¢ US). There are a couple of ways to get to Ko Kret. The "adventurous" way and the easy way. We went the adventurous way. 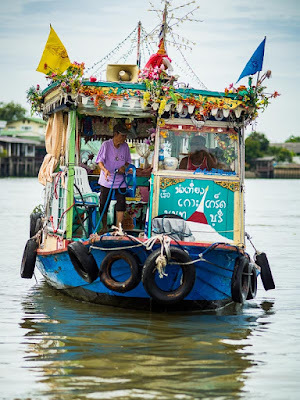 We took the BTS Skytrain from our apartment to the river, where we caught a Chao Phraya Express Boat and went to the end of boat line in Nonthaburi. From there we caught a taxi to Pak Kret, the community on the "mainland" opposite the island and then we took the ferry to Ko Kret. It took us three hours from the time we left our apartment to the time we stepped on the island. It's 20 kilometers (roughly 12 miles) from Bangkok to Ko Kret. The BTS fare was 42Baht ($1.17 US), the boat fare was 15Baht (0.42¢ US) and the taxi fare from Nonthaburi pier to Pak Kret was 130Baht ($3.65 US). If we do the math, the total cost to get to Pak Kret was 244Baht ($6.85 US). The easy way is to take a taxi. It's a 45 minute to one hour cab ride from central Bangkok to Pak Kret, depending on traffic. Cab fare costs between 225Baht and 275Baht ($6.30 US to $7.70 US), depending on traffic. An air conditioned taxi the entire way is almost exactly the same price as the unairconditioned adventurous way, is more comfortable and takes 1/3 as long. The next time we go to Ko Kret we're taking a taxi. The leaning stupa at Wat Poramaiyikawat is the most recognized landmark on Ko Kret. The best way to get around on Ko Kret is to walk. It's flat, the path is paved and shaded and it can be a pleasant stroll. There are bikes for rent on the island, but the paved path is not very wide and there are a lot of people out walking around, so navigating a bike through the crowd can be tricky. There are a few motorcycles but no cars on the island. We spent a couple of hours wandering around the island, had a tasty lunch overlooking the river, wandered about a bit more and then headed back to Bangkok. 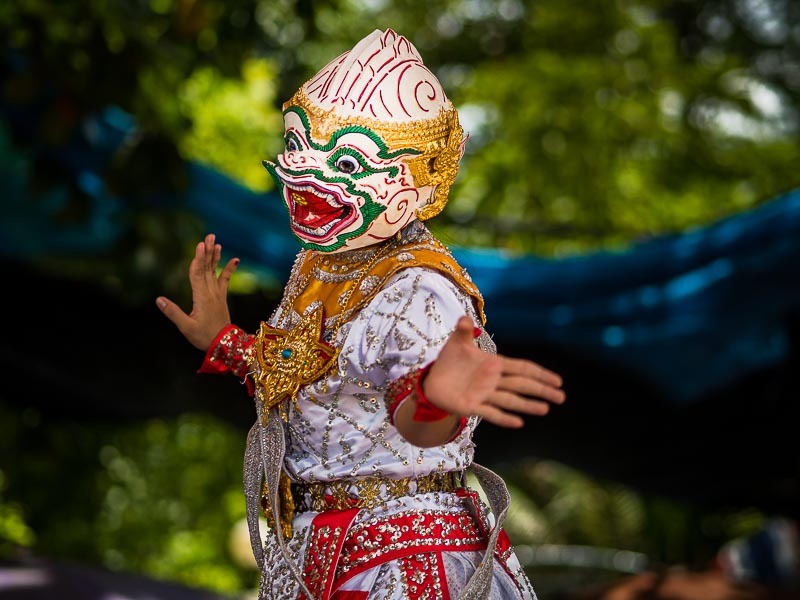 A dancer performs as Hanuman during a performance on the island. It was a very pleasant way of spending a Saturday afternoon. Now that we've been to Ko Kret, and we know the easy way of getting there, I suspect we'll go back. There are more photos from Ko Kret in my archive.